Banner Saga 2 for Nintendo Switch will launch on Thursday 7th June, 2018. 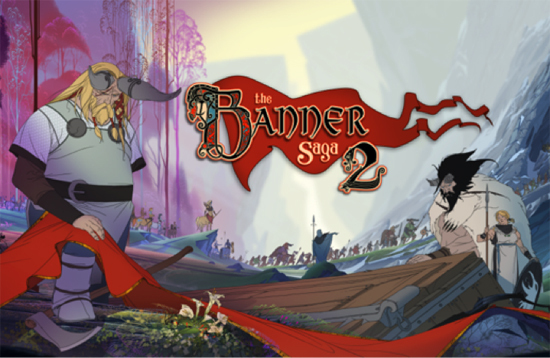 Banner Saga 2 is the exciting sequel to the award winning, BAFTA nominated, indie hit The Banner Saga, a mature-themed role-playing strategy game where a player's choice directly affects their personal journey. Banner Saga 2 is an emotionally charged sequel as you shoulder increasing responsibility for the survival of your clan in the face of immense grief. As others look to you for guidance, your choices continue to count and bold leadership decisions, wise use of resources, and skilful battle tactics are vital to ensure your survival. Banner Saga 2 also introduces a new race to the series, the legendary horse born, a centaur-like race which enhances combat and adds another layer of intrigue to the story. It also releases with a brand new evocative soundtrack composed by grammy nominated and BAFTA winning composer, Austin Wintory. “We are proud to launch Banner Saga 2 on Nintendo Switch, hot on the heels of the launch of the first game, The Banner Saga last month. There has never been a better time to get into this awarding winning series. Strategy and RPG Nintendo Switch fans will get the opportunity to play through the entire saga, from start to finish, this Summer when the third and final chapter Banner Saga 3 releases. Playing this game on the Nintendo Switch is truly a joy, allowing you to play whenever and wherever you can.” said Steve Escalante, General Manager of Versus Evil. Banner Saga 3, the third and final installment of the mature themed role playing strategy series will launch on July 26th, 2018 for PC, Mac, PlayStation 4, Xbox One and Nintendo Switch. Mobile platforms are expected to launch later on in the year. The Banner Saga, which launched to much critical acclaim has received several awards and nominations, including winner of the 2014 Geekie Awards for “Best Video Game”, winner of 2014 Game Developers Choice: “Best Debut” award, finalist placement for “Excellence in Visual Arts” category at the Independent Game Festival, 3 BAFTA Award Nominations, and winner of Pocket Gamer’s 2015 Best Adventure/RPG Game and Best Android Game of the Year. The Banner Saga was nominated as Role Playing Game of the Year at th 18th annual DICE Awards, and Banner Saga 2 have been nominated for Strategy Game of the Year at the DICE and Game Awards events. The Banner Saga is available on multiple formats including Steam for PC, PlayStation 4 and Xbox One as well the App Store for iPad and iPhone, on Google Play and Amazon for Android devices and on Windows based tablets.